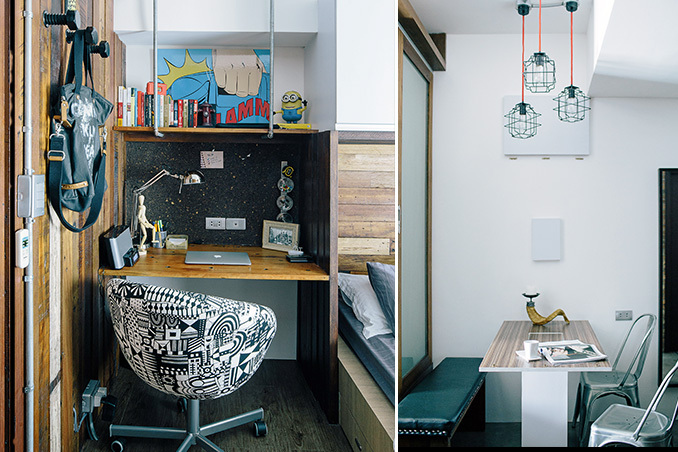 Kurt Reyes, with the help of architect Red Fuertes, transformed his new condo unit in just 60 days. Salvaging only the kitchen sink and some cabinets, he turned the space into a New York-inspired pad. He wanted an industrial theme so he bought most of the items found in his space, including the dishtowels from IKEA. Since the owner loves to cook for friends, more space was allocated for the kitchen. The area has a table that folds up when not in use and a movable base that doubles as a bar for drinks. The entire kitchen which was re-tiled in metallic mosaic, is sleek and functional, complete with a new countertop and tap. Another big space was allocated to the elevated bedroom enclosed by sliding doors made of salvaged wood. The space underneath serves as storage for Kurt's shoes and luggage. In the living area, the red brick wall, with a portion dry-brushed with white paint for contrast, accommodates shelves made from salvaged wood and aluminum pipes that hold books and other trinkets. The tiles that came with the turned over unit were replaced with Spanish tiles while a portion of the wall was left in bare cement. Since Kurt works from home twice a week, his favorite area is the corner desk in his bedroom. The mini home office showcases pieces from IKEA combined with locally bought accessories. Overall, the unit allows him to experiment with different styles and designs. “If I get bored, I will just change the stuff on the shelves. It really reflects my personality: no fuss, industrial, low-maintenance. You can do all sorts of stuff you need to do,” he shares.